The fall/winter season can bring a whole set of new health problems for your precious bundle of joy. The dry, itchy air can make your baby cough, wheeze and have a stuffy nose. And how can we forget the croup- a barking cough that every parent dreads during the dry seasons. So, as a parent, is there anything that you can do apart from providing care and comfort? Sure, you can! As it turns out, moist air can help relieve the upper respiratory symptoms such as coughing and wheezing. Fortunately, there are a ton of humidifiers on the market, that can do just that! Humidifiers can also help soothe the dry and itchy skin of your young one during the drier days. 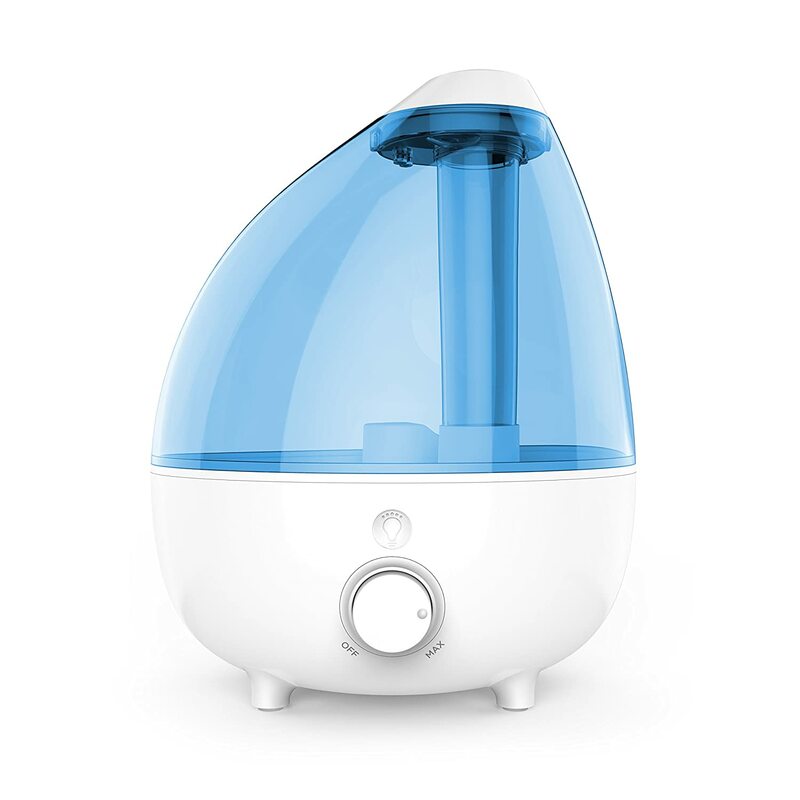 So, if you are wondering what humidifiers are and do you need them? You have come to the right place. In this article, we will learn more about humidifiers and also help you decide the best humidifier for a baby that you should buy. Do you need a humidifier in your baby’s room? Do you need a humidifier for your baby? When it comes to the necessity of humidifiers, parents are somewhat split. While some parents feel that humidifiers are essential, especially during the cold and flu season, others seem to think of them as gimmicks that don’t work. However, the fact is that humidifiers can make a huge difference in the comfort levels of your baby during the cold and dry weather. Many parents experience that incidences of a sore throat, stuffy nose and wheezing cough decrease significantly once they start using humidifiers. If you are using the indoor heating system during the colder months, it can rob the air of moisture quickly, and a humidifier becomes a necessity. Some people also have found humidifier uses for allergies as well. The moist air seems to help in relieving symptoms of seasonal allergies. But please, you should know that humidifier may cause more harm than good IF you have indoor allergies especially the dust mite, dust mite love moisture environments that’s why it’s recommended to keep the humidity level in your house between 40 to 50%, otherwise, you may have many dust mite babies around you. Some humidifiers have a sensor that adjusts and display the humidity level in the room, others didn’t, but you can use this hygrometer to monitor the levels. In a word, yes! You do. But what is the best humidifier for baby? There are a ton of options to choose from, and all of them seem to be the same, right? Let’s see what different types of humidifiers are and how they work. What are different types of humidifiers? There are two types of humidifiers available on the market, depending on the mechanism of humidity generation- the warm mist humidifier and the cool mist humidifier. Warm mist humidifiers, as the name suggest produce a warm mist of water vapor. They have an inbuilt heating system that provides a warm mist of water vapor laden air. Many parents prefer the warm mist as the warmer air can make it easier for the baby to breathe than the colder air. Cool mist humidifiers, on the other hand, don’t have a heating element. The air these humidifiers release is at room temperature and not hot. The most significant advantage of these humidifiers is that as there is no heating element, there is less chance of accidental injuries due to the hot water. The choice between the warm or cool mist humidifier depends on your personal preference, but I suggest you to check the Dr. Ari Brown’s opinion in the video below, she may influence your choice. Picking the best humidifier can be a bit of confusing. That said, if you know what to look for, the choice can be made a bit easier. So, here are some of the things that you should be looking at while purchasing a humidifier for your baby. You are going to use the humidifiers during the night time and when your baby is asleep. You don’t want a humidifier that makes a loud buzzing noise, do you? So, make sure that you are paying close attention to the noise levels of a humidifier before picking one up. Ease of cleaning is another feature that is very important to consider. A humidifier houses water, and if it is not cleaned on a regular basis, it can be a breeding ground for bacteria. Make sure that the humidifier that you are picking is easy to clean and you can clean it as often as you can. Auto shut-off is also a nifty feature that is a must in the best humidifier for a baby. Many humidifiers are equipped with this feature and shut off automatically when a desired level of humidity is achieved in the room. This feature helps you to attain and more importantly, maintain the desired level of moisture in your baby’s room. It is also essential to be able to control the relative humidity in the room. You don’t want a humidifier in which you can’t control the level of moisture in the air. There are many good humidifiers on the market that have a ‘humiditystat’ that controls and maintains the desired level of humidity in the room. There is no shortage of humidifiers on the market. However, some of them are head and shoulders above the competition. Here are four of the best humidifiers that you can buy. These humidifiers get our recommendation as they are superior in performance and offer the best bang for your buck. One of the best Cool Mist humidifiers on the market, the hOmeLabs extra-large humidifier is best for any small bedroom or a nursery. A very good choice for people who have a dry skin. One of the best thing about this humidifier is the fact that it uses ultrasonic waves to generate a fine mist of moisture-laden air. What puts this humidifier on top is the fact that it uses a ceramic vibrating element rather than the metal one. The ceramic element prevents the formation of what is called ‘white mist,’ a common problem with ultrasonic humidifiers using metallic vibrating element. You will not need to buy any filter because this winner from hOmelabs is a filter-free. The water tank on this unit has a capacity of just over one gallon (4 liters) which is enough to keep this thing going for long hours, up to 30 hours if you are using a low-intensity mode. The unit also features an automatic shut-off mode and a constant humidity mode. All you need to do is set your desired humidity level, and the humidifier can maintain that level without any issues. Another great point, this product has a clear window, so you can see how much water is left in it. Overall, it is an excellent unit for a small bedroom or a nursery, and we highly recommend it. 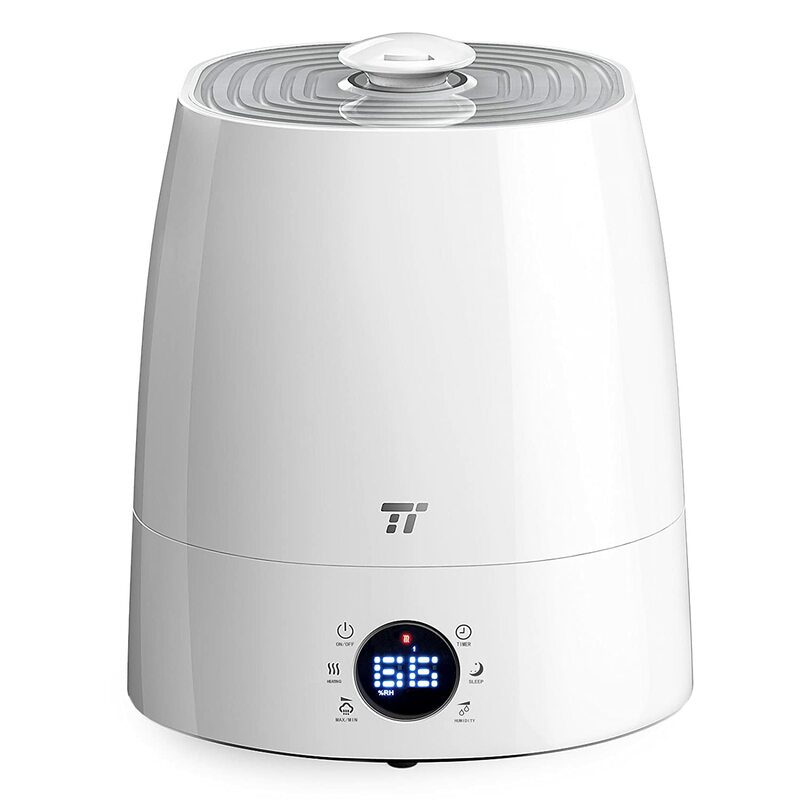 When it comes to humidifiers for baby, TaoTronics is a name you can bank on. The unit has an excellent build quality and makes most other humidifiers look like toys. With its sleek look, this humidifier will enhance the look of any room you put you install it. 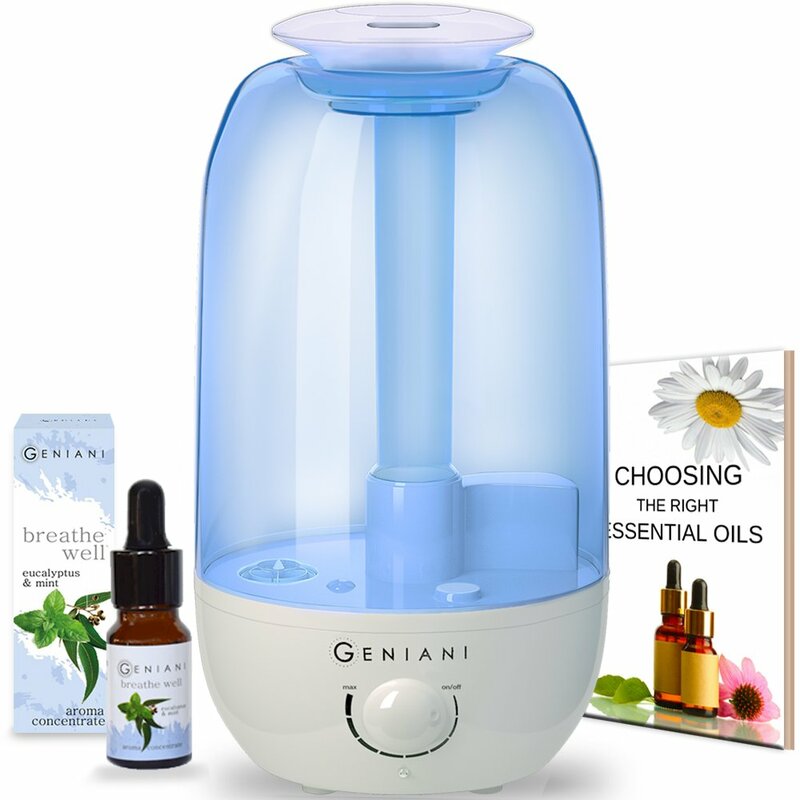 It uses the ultrasonic technology to dispense mist and can also be used for distributing aromatherapy oils as well. One of the start features of this unit is that it has an accurate humidity sensor that can sense the humidity in the room and regulate itself to maintain the perfect moisture in the room. With an extensive capacity 1.46 Gallon/5.5 liters, this humidifier can last all night long without you having to worry about refilling it. Indeed, this TT-AH007 model can rum up to 40 hours on the LOW humidity setting and 16 hours on the HIGH setting in the cool mist mode. You can also use the Warm mist, this mode consumes 1.46 Gallon in 32 hours on the LOW humidity setting and 10-12 hours on the HIGH setting (Sorry, not sure exactly how many hours you will need to finish the tank’s water in this setting but sure about that unit will shut off automatically when a low water level is reached). Oh! I forget to mention, this TaoTronics baby has a digital display reading the current humidity in the room, believe me, its a very useful option. 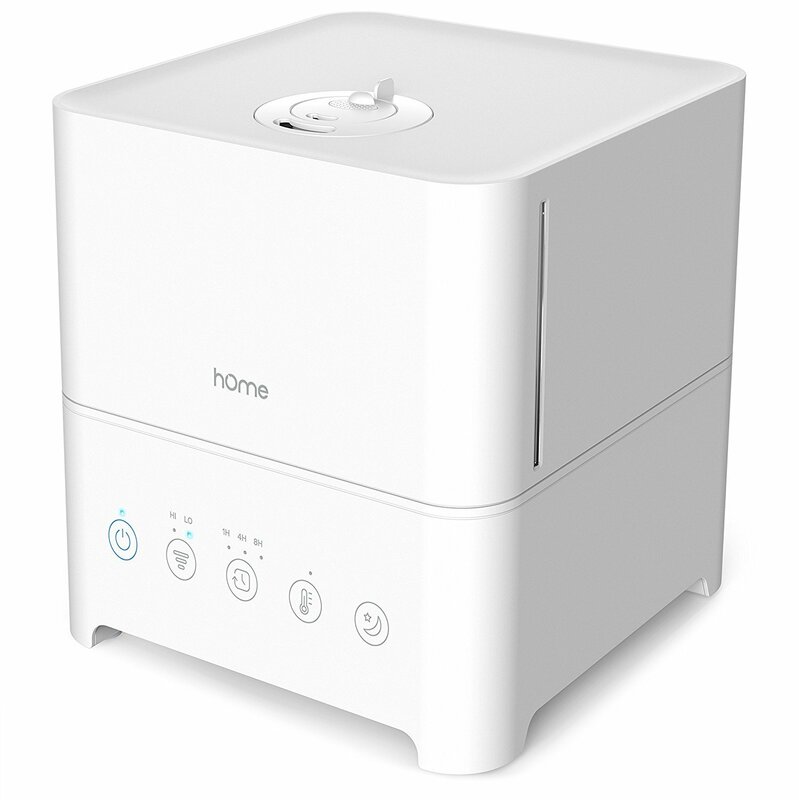 Overall, you can’t go wrong with this humidifier for your baby. I’ve long realized that humidifiers with merely a few ml capacity run shorter than a baby’s nap! A tank that empties out just when things are getting too busy is quite inconvenient, and the gallon-full MistAire XL was exactly what I needed. Big as it is, the humidifier saves me valuable time from frequent refilling. At higher settings and on dual mist, it would effectively moisturize air for half of the day. The MistAire Ultrasonic unit conveniently doubles as a night light faint enough to maintain a relaxed atmosphere. On any day, you can achieve your ideal home comfort level via the variable cool mist control knob and use your nozzle of choice. Like any new product, we bring home, what matters most is our family’s health and safety. The unit automatically shuts off when the water level gets too low or when removing the tank for refilling. Air is safely moisturized for 10-24 consecutive hours. Regular cleaning of the tank cavity should keep your MistAire Humidifier well-maintained. With no filters to replace and included brush right within the reservoir, cleaning the unit is an effortless task among all other things you’ve got packed to do in a single day. 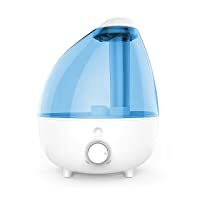 In determining the best humidifier for baby, what would moms do? Research and learn! Here’s to share another one of my own experiences, this time with the GENIANI Ultrasonic Humidifier. As humidifier and essential oil diffuser in one, you get more for your money’s worth and some space to spare. The 2.4 L capacity is enough to fill small to medium rooms with the cool mist and last until the next refill, which is approximately every 2 days. You’d know it once the smart LED indicator turns from green to red. The cool mist is especially helpful during cold and dry weather where we find ourselves in a better mood when anyone would have otherwise been uncomfortable. When used in baby’s room, I’d turn it on and let it quietly do its job in the background while we get some restful sleep. I also sometimes use it in our bedroom to diffuse some of my favorite oils, relax and unwind. 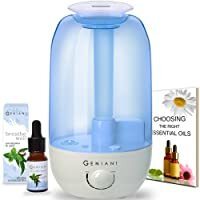 If you want a great deal of mist for a conveniently long period and like the pleasant scent of essential oils, the GENIANI Ultrasonic Aroma Humidifier is a good choice. Again, most humidifiers don’t have a sensor or a LED screen to provides you most accurate measurements indoor, that’s why I recommend you to use this hygrometer to monitor humidity levels in your baby’s room. It’s very useful, because this monitor shows you different information like humidity, temperatures, dry, comfort and wet conditions, and that’s what we need. Whatever humidifier you choose. It is really important to clean and change the filter in the humidifier (if your humidifier uses a filter) on a regular basis to avoid the composition of bacteria/fungi and its diffusion in the house’s air. Photo & Video credits: Amazon, DadLabs.